Yesterday was that day when you get to find out how truly gullible all your friends are, and how many would really fall for absurd news stories - aka April Fool's. It's a day when I stay off social media for the most part, because the tomfoolery gets to be a bit much and on occasion I wince when I see people taken in by transparently false stories (and that's when I realize how snake oil salesmen have made their fortunes, both in the past and the present). 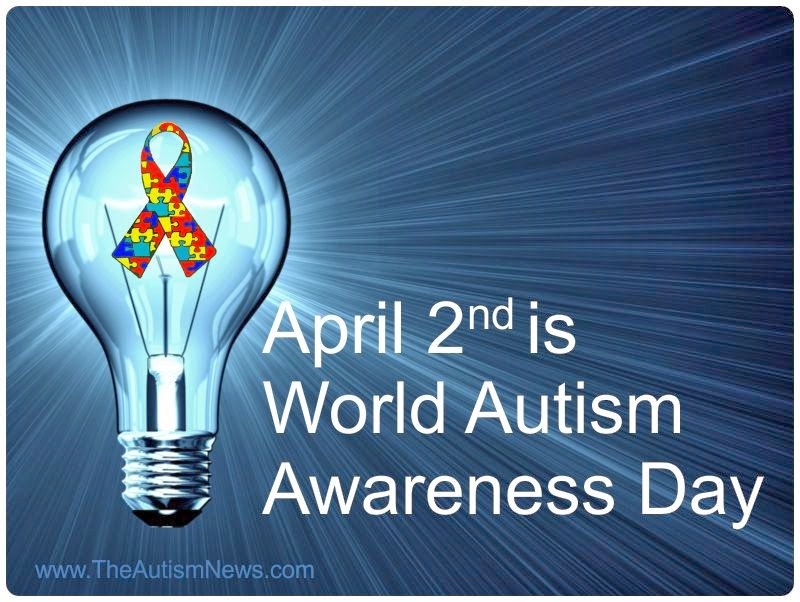 But today is a new day, and with it comes a new theme - because today is World Autism Awareness Day. When I was growing up autism wasn't even a word that I knew, let alone a recognized issue in child development. Oh, there were undoubtedly children and adults who were autistic, but we had other words and labels we used, ones that we now recognize as being both woefully inaccurate and demeaning to those afflicted with autism. Things have changed over the decades and our understanding of autism and the autistic spectrum has widened - but are we truly aware of it until it touches our lives? I suppose I am not so certain. I would suggest that most parents are familiar with a child with autism now. I suppose that is because autism affects 1 in 68 children in our country. · Autism now affects 1 in 68 children. · Boys were almost 5 times more likely to be identified with ASD than girls. About 1 in 42 boys and 1 in 189 girls were identified with ASD. · This new estimate is roughly 30% higher than the estimate for 2008 (1 in 88), roughly 60% higher than the estimate for 2006 (1 in 110), and roughly 120% higher than the estimates for 2002 and 2000 (1 in 150). · Most children identified with ASD were not diagnosed until after age 4, even though children can be diagnosed as early as age 2. It seems no wonder that autism has touched most of our lives, either through our own children or the children of family, friends or coworkers. We understand so much more about it now, but with each new understanding comes the realization of how little we actually know. There is no known cure, and there is no definitive cause, although there are many theories. What I do know is this: autistic children and their parents need our support. When I served on parent council at a local school we developed the funds to provide the autistic children in our school with a sensory room, a facility proven to have beneficial effects for children on the spectrum. It was a proud accomplishment, but clearly not enough as we still struggle in this community to provide the support and facilities needed for children on the autism spectrum - and as the number shows above the rate of autism is increasing. In a community known for a incredible birth rate this means our numbers of autistic children will also climb, meaning even more demand for services and supports for those children and their families - and we will need to be ready to meet them. Today I ask you to do one thing. Just sit down and read one article about autism. Learn something you did not know before, and understand that autism is impacting our world and our lives through the sheer number of individuals affected. It has profound implications for our health care system, our education system and the fellow community members who deal with it every day because their lives have been impacted much more directly than our own. Yesterday was April Fool's and a day for trickery. Today is World Autism Awareness Day and a day for understanding and learning. I hope every single one of us expends the same kind of effort on learning about autism that we did on playing pranks or reading bogus news stories - because 1 in 68 children in our country is relying on us to do so.